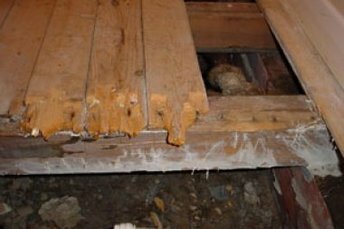 Dry Rot and Wet Rot are wood-destroying fungi which attack timber in order to extract food to maintain growth and the generation of spores. Affected timber exhibits significant loss of weight. In buildings the result is the deterioration and ultimately destruction of the timber with serious consequences in the case of structural sections. The problem affects all types of property, historic or modern. Dampness combined with lack of ventilation provides the ideal conditions for fungal decay. 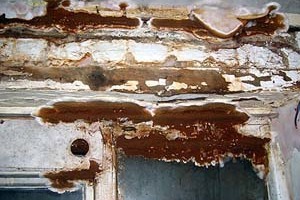 Wood rotting fungi can be commonly grouped into species of wet rot (of which there are many varieties) and dry rot. All forms of fungal decay are associated with moisture content levels within timber and microscopic airborne spores. When the spores come into contact with damp timber they germinate and develop thread like strands called hyphae which in turn penetrate time structure of the timber. Hyphae then release chemical enzymes into the timber. The decay process occurs when the chemical enzymes are absorbed by the fungal hyphae, enabling the fungal growth to occur. For this process to occur the moisture content within the timber needs to exceed 22% at this point a network of Mycelium threads will rapidly grow and extend through timber at a moisture content of less than 22% the decay process will slow or even stop. We provide wet and dry rot surveys throughout Bristol, Reading, Exeter, London and Surrey for homeowners and business owners. You can request a survey here.